At the center of our parish life is the Holy Eucharist, the identifying act of the Christian community. It is the principal act of worship on the Lord’s Day and other major Feasts. The Eucharist is the sacrament of Christ’s resurrection and his ongoing presence at work among us. In the Eucharist, Jesus continues to live in us and we in him. At St. Paul’s we offer a Radical Welcome from the Steps to the Table. Everyone is welcome to receive the Eucharist—no matter who they are or where they may be on their journey of faith. The Holy Eucharist is offered at 9am and 11am each Sunday morning. Both services include excellent preaching and the promise of a Communion table open to all. At the Gospel procession, children ages 4-8 are invited to a time of Children’s Worship with their friends and an adult leader, before all return to the church for the sacrament of Holy Communion. Parents and guardians are welcome to attend with their children. For children younger than four, or for those children who wish to remain with their families, the Chapel of the Angels on the right side of the church is available as a quiet, comfortable space during worship. Busy bags can be found in the back of the church. Morning services at St. Paul’s are followed by Coffee Hour, a time for refreshments and fellowship with one another. At the 9am service, the music is led by the organ and a professional vocal quartet. At the 11am service, children, adults, volunteers, and professionals alike come together in the choir to lead the glorious hymns and anthems. Over the summer months, the Sunday morning liturgy is abbreviated and the choir breaks from its regular programming. All are welcome to sing in the volunteer summer choir, which meets at 10:10am every Sunday in the Choir Room. Wednesdays at 11:30am: a spoken service with Homily & Holy Communion, held in the Lady Chapel. Held year-round. Thursdays at 6:00pm: Holy Eucharist in the Celtic tradition, including sung hymns and piano accompaniment, held in the Church. This service is held seasonally. Click here for a listing of upcoming Celtic Eucharist services. The daily offices of Morning and Evening Prayer are offered seasonally. A beautiful service of Evening Prayer, led and sung by the choirs of St. Paul’s, held on select Sunday afternoons at 5pm. Click here for a listing of upcoming services of Evensong. 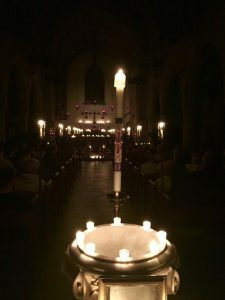 A brief, contemplative, soothing service chanted every Sunday evening by the choir in a darkened, candlelit church, beginning with the tolling of bells at 9pm. Doors open each week at 8:30pm for quiet prayer. On select feast days, Compline is followed by a simple Holy Communion for all who wish to remain.